Note: This post contains affiliate links. If you click out to purchase this course I will be compensated a small share. Thank you for your support. If you love broomstick lace crochet then you will enjoy the Beyond Basic Broomstick Lace (affilate link) by Jennifer Hanson. The course is for total newbies at broomstick lace, but also provides some really cool tips for the more experienced broomstick lacers as well. In a nutshell, this course teaches you how to crochet the gorgeous top you see in the above picture. The course also includes other patterns and techniques, but the main focus is on the top. Jennifer takes the time to explain every detail, such as how to crochet the foundation single crochet and why you would use it. She offers tips on gauge, blocking, how to modify the top so that it’ll fit you, and so much more! I wish I would have known some of those tips and tricks when I first started crocheting. And best of all, the knowledge she gives you to complete this top is not just for this project, or just for broomstick; but it’s something you’ll use over and over again in other crochet projects as well. Another beauty of this course is that she shows you a few awesome crochet stitches that you can make with broomstick lace. This was the main reason why I purchased the course, just so I could learn a few more broomstick lace stitches. It’s really amazing some of the things you can do with the lace… like did you know that you can twist and cross the loops for a unique look? I had never seen or heard of it before until now, so I thought it was really neat. The course also covers things like working in the round, and how to go about it if you don’t have a circular needle. She’s also got a cool tip on how to eliminate the awkwardness of having to crochet off a needle. To be honest, I’m not quite brave enough to do what she does, but I can see how it would make your life a lot easier. Another bonus of this course is that it is offered at Craftsy, where you can watch and learn any time at your convenience. You can bookmark your favorite parts in the video lessons so you can come back to them in a few clicks; and Jennifer explains how you can do that. She’s a really awesome teacher. She was self-taught at broomstick, and has many helpful tips to share. And if you’re looking for broomstick lace patterns, you might want to check out the CNC broomstick lace collection. 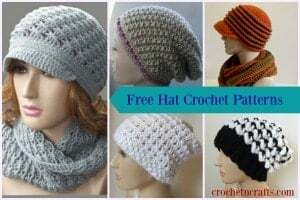 Or, visit CPB for a few other free broomstick lace crochet patterns.